With home fuel costs constantly rising, homeowners need to continuously find ways to save energy and improve their home’s heating efficiency. One way is with SolarChoice Heat’s window treatments. SolarChoice Heat manufactures and sells window blinds that are specially designed to provide passive solar heating. According to SolarChoice Heat, their specially designed window blinds, referred to by the product name SolarChoice Heaters, can save as much as 35% on home heating bills. SolarChoice Heaters are simple in design, however ingenious in application. 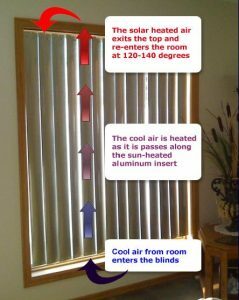 SolarChoice Heaters are effectively window blinds that have hollow vertical vanes with an aluminum core insert, and nothing more. There are no fans, blowers, or other electrical appliances that come with them. Instead they simply rely on solar energy and the basic thermal principle that hot air rises. They are truly the perfect model of a passive home heating system. As the sun heats up the window blinds, the warm air inside each vane rises and flows out the top, heating the room. Simultaneously cooler air from within the room is drawn into the base of the vanes. The air flow rate through the window blind vanes is 1.2 meters/sec according to SolarChoice Heat. As a result, it only takes 2-3 seconds for a volume of air to enter the bottom and pass out through the top of the window blind vanes. 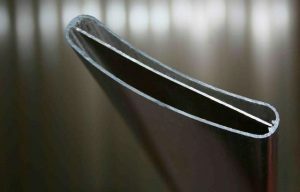 In addition, due to a black coated aluminum insert used in the construction of the window blinds, air that enters the base of the vanes at 60o (F), exits the top of them at 120o (F). Between the high velocity and the dramatic rise in air temperature through the window blind vanes, SolarChoice Heat’s claims of up to 35% savings on home heating bills is not so inconceivable. If their actual performance is even a quarter of their claims, SolarChoice Heaters are still undoubtedly an Eco-friendly and Green home building product. What also makes them so neat is their versatility with the seasons. When the angle of the sun is lower on the horizon during winter months, south facing windows with SolarChoice Heat window treatments bear the full brunt of the sun’s rays and thus work harder to produce heat. During summer months, on the other hand, when the angle of the sun is much higher, their heating efficiency is reduced, and thus they serve their other purpose of keeping the home cooler. olarChoice Heaters also offer additional benefits. Besides home heating oil and gas fuel cost savings, they can also help to reduce electricity bills as hot water circulation pumps, and hot air fans are used less frequently. In addition, the life of this equipment is also extended. Also, when water or house plants are placed on the floor near the heater vanes, moisture and oxygen generated from the plants can be drawn into the vanes and circulated throughout the home. SolarChoice Heaters are installed like any other window treatment blind, making it an easy do-it-yourself project. They cost approximately $20/square foot, and can be custom ordered on line at SolarChoice Heat. So if you are looking to save some money on your home heating bills and create a greener home, take a look at SolarChoice Heaters.